It’s 6pm and everyone is home. You switch on the Plasma TV to watch your favourite show. It is almost dark outside, so all the lights are on. Someone’s put a load of washing on and you can smell dinner cooking in the kitchen. You can hear the shower running and loud music playing. You log on to check out what your friends are doing online….. This is typical of energy use in many homes. What choices can you make to change your energy use at your place? The simplest way to reduce your energy use is to turn things off when they are not being used. Switch off your lights when you are not in the room, turn the TV off at the wall and switch off your air conditioner when you leave the house. Also knowing how much energy your appliances use can help you choose to use them more efficiently and reduce your energy use. A ceiling fan uses 60 watt-hours whereas an average air conditioner uses 2000 watt-hours. A watt-hour is a measure of energy used in one hour. On your electricity bill, the energy used is measured in kilowatt-hours (1000 watt-hours). We use the most energy at home between 4 pm and 8 pm. This 4 hour period is called the ‘peak period’. Energy companies use more equipment and need more resources to provide this increased energy for just a few hours. This is a less efficient use of resources and increases your electricity costs. Choose when you turn things on. Not everything has to be turned on between 4pm and 8pm. Load up the dishwasher, but turn it on after 8 pm. Turn off the computer while you have stopped to eat dinner. Switch off lights when you are out of the room. Not all TVs are the same. The size of the TV and whether it is a Plasma, LCD or LED TV changes how much energy the TV uses. The more energy the TV uses, the more expensive your electricity bill will be. So choose a TV that’s the right size and energy cost for you. Most electrical appliances have an energy star rating. The more stars, the more energy efficient the appliance. Each star can save from 10% to 30% of energy, depending on the appliance. When shopping for similar appliances, you can compare the stars to find out which appliance is the most energy efficient. • Ride the energy bike – can you make enough energy to power a TV? • Energy hungry – guess how much energy appliances use. • Balance your home energy – switch on the appliances. Are you in the Green energy zone? • Is it electric? – choose what uses electricity and what doesn’t. Visit Living Greener, an Australian Government website, to explore energy labels and energy efficient iances. 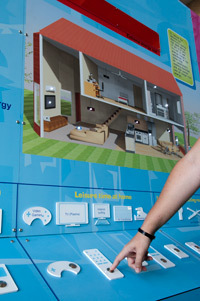 Visit ENERGEX Saving Energy to explore Peak Period and a guide to saving energy.